Then there has been the solitary and meditative discipline of swimming — open water in particular. 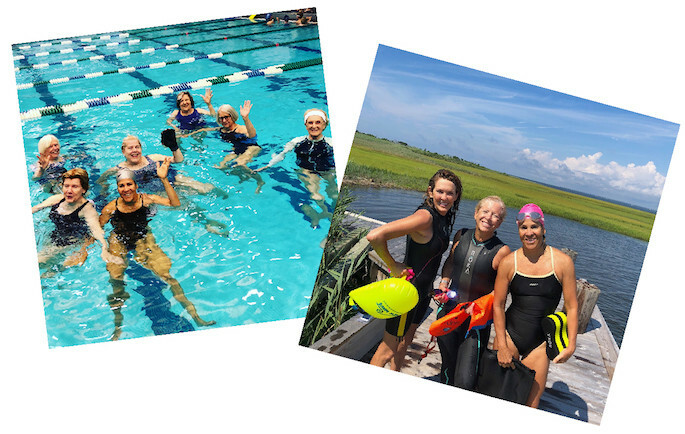 I’ve always been a pool swimmer, but this summer I’ve conquered my fear of what lies beneath in murky water with an experienced training partner, and discovered the goal achieving satisfaction of swimming to a destination – like a long distance run! 1. ROKA SIM SHORTS $80-120. A pull buoy, vertical kicking tool, and race day simulator all in one — the Roka SIM short is the ultimate training tool for triathletes and swimmers! This neoprene buoyancy short mimics the lift and body position of a wetsuit without the added heat. 2. KEIFER SAFERSWIMMER® LARGE OPEN WATER SWIM BUOY $49. Stay safe in open waters with the Keifer Saferswimmer® which keeps you highly visible to boaters, jet skis, paddlers and surfers. Neon orange, lightweight, and inflatable, the buoy attaches around the waist and floats behind as you swim. A dry pouch holds small essentials, and the buoy can also be used as an emergency flotation device. 3.SPORTI SILICONE SWIM CAP $2.95. The price is right with this silicone swimcap and with so many fun colors available, why buy just one! 4. SPORTI PULL BUOY $6.95. Not allowed to kick, the pull buoy has been my life saver this summer. This flotation tool keeps body position elevated and aligned for a more streamlined and efficient stroke. Who’d imagine I’d be a better and faster swimmer not kicking! TO GREAT SOUTH BAY SWIM! 5. TYR CATALST STROKE TRAINING PADDLE $29.95. The fully customizable TYR Catalyst Stroke training paddle is available in seven size options. It’s designed to be strung a variety of ways and offers a range of resistance for any level swimmer. 6. ADIDAS ADILETTE CF+ $35. The Adilette debuted in 1972, and this retro pool slide has never gone out of style. It still looks as cool at the pool as it does to and fro. Far more anatomically designed than your typical flip-flop, it’s also a much better summer sandal for injury prevention! 7. ROKA X1 GOGGLE $22-27. With four different styles to fit any face and size preference, award-winning Roka goggles deliver razor-sharp optics in 10 proprietary lens tints that block 100% of UVA, UVB, UVC & harmful blue light. My choice shown above is the oversized X1 which fits over the eye socket for more comfort. Maximum forward visibility is delivered in a low drag profile, with soft and hypoallergenic silicone gaskets. 8. ARENA ICONS COLLECTION. If you grew up swimming you’ll remember this iconic swim line of swimsuits and warm-ups. The new Arena ICONS Sportswear Collection is a throwback to that original 70’s style and includes the track suit, shorts, tights and more! 9. SPEEDO AQUAFIT DUMBBELLS $24.99. Turn the pool into a gym with these water dumbbells from Speedo that utilize water resistance with great effectiveness to build strength and increase flexibility. I’ve been using in combination with Aquajogger below for a killer total body workout! 10. AQUAJOGGER $45. Great for rehab and all around fitness, the Aquajogger keeps you afloat while running in place and doing other pool exercises. It’s keeping this runner conditioned for when she returns to the open road in just a few weeks! 11. FINIS ZOOMERS GOLD SWIM FINS $31.99. 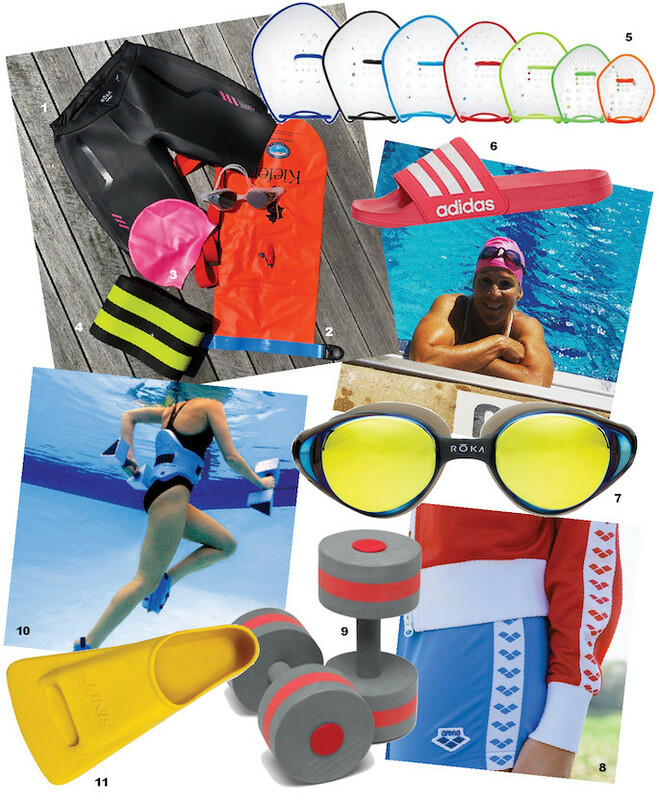 The original training fin, the Zoomers Gold is the latest and most advanced version of these bestselling swim fins. With improved fit and performance, and a softer rubber foot pocket, the short blade encourages smaller, faster kicks while increasing ankle flexibility and endurance.